You can listen to 'San Francisco' here. Interesting title, isn't it. I'd expect to read peace & love, but no. Magic. What has that got to do with the summer of love? The music on this album directly refers to this period and just before when The Mamas and the Papas scored its greatest hits, Jefferson Airplane recorded 'Takes off'. When folk started to blend with rock and psychedelics that wiped out a whole generation of folk singers that were either purists or were unable to switch in time to the new sound of the nation. When San Francisco took on a magical attraction to youths of all sort that started to tune in, turn on and drop out. So here's the magic explained. Foxygen is the duo Jonathan Rado (any relation to James?) and Sam France. 21st Century ... is its second album within a half year, after 2012's 'Take the kids of Broadway'. Reading a review of the album I almost decided not to listen. It completely sidetracked me on expectations. Instead I'm listening here to a great record full of mid 60s folkrock, psychedelia and great pop over tones. 'No destruction' is the electrified Bob Dylan on 'Highway 61 revisited', the melody lines of the singing, the organ in the background, the harmonica. Other songs have the playfulness of Love, the band from San Fran that never really broke, but made a lot of gems. How nice it is to be surprised. Rehashing old stuff is not necessarily a good thing. However, when it's done with a set of songs that are at least on the same level as the originals, there is nothing wrong with working off examples. Foxygen does just this. A great set of nine songs with familiar sounds, but brand new. Although the refrain of 'One blue mountain' comes dangerously close to Elvis' 'Suspicious minds'. At the same time the song reminds me of The Violent Femmes in its total religious frenzied craze 'Hallowed ground'. After Christopher Owens' 'Lysandre' this is the second album from San Francisco that looks back on the rich legacy the town has in the pop world. The difference is that 'Lysandre' is somewhat more lushly produced but remains aloof. 21st Centrury ... pulls the listener in, despite the fact that it is more sober. Just like 'Lysandre' the album has an instrumental song in the middle. Here the psychedelic 'Bowling trophies'. Another nostalgic trip down memory lane, but again one that I truly enjoy. Another mention deserved is the kinship with Belle and Sebastian. 'San Francisco' could have been a song of this Scottish band in its sweet dreamlike quality and all. The title song is sung with the brazenness of Mick Jagger in 'Get of my cloud'. In other words not much relevant influences escaped this duo in making 21 Century ... an exceptional record. 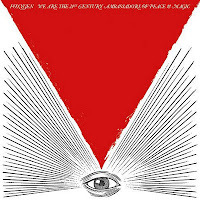 Foxygen offers nothing new. Obviously there is a stream of bands reinventing the past in a superb way at present. As they do with the quality that's on offer on 21st Century ... they are welcome in my home. How about yours? And it makes me quite curious on where this trip is leading in the future. Which roads to explore and expand to?